ProjectGuitar.com Chris - again, warm congratulations on both your second Guitar Of The Month win and now Guitar Of The Year for 2017....great work! Would you like to introduce yourself a little? Well, I'm 53 years old. I live in Chester County PA in the USA. I work in IT for my "day job" as a UNIX engineer. Happily married for 20 years to a wonderful woman that has always been very supportive of my extracurricular passions like skydiving and more recently building guitars. We have 3 hairless dogs (Chinese crested) not for showing or breeding, but just because we love them. I've been playing guitar since I was 12 years old, always been musically inclined. Ive been in many bands, and I've built a recording studio in my house. 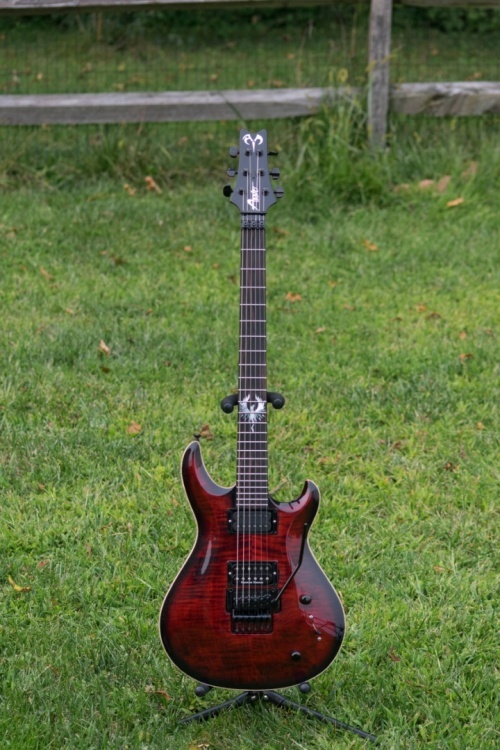 I came into the guitar building world because I commissioned a guitar build from a local builder about 7 years ago. It took him 4 years to deliver the guitar, and I wasnt very happy with the result. To make amends for the long wait he gave me a partially completed build as a bonus, and I started looking into what I would need to do to finish it and eventually decided to try a build from scratch about 3 years ago. I never did finish that partial build the other guy gave me. Its still sitting in my basement. I think I would never have been happy claiming it as mine since someone else did most of the work. 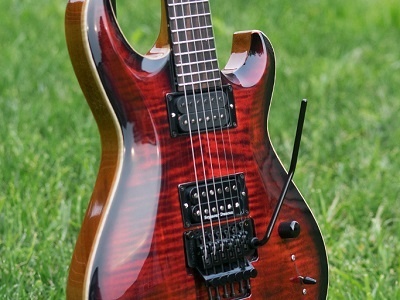 On-line communities like this one (ProjectGuitar.com) have been a wealth of both information, advice, support, (and even friendship) in my quest for knowledge. 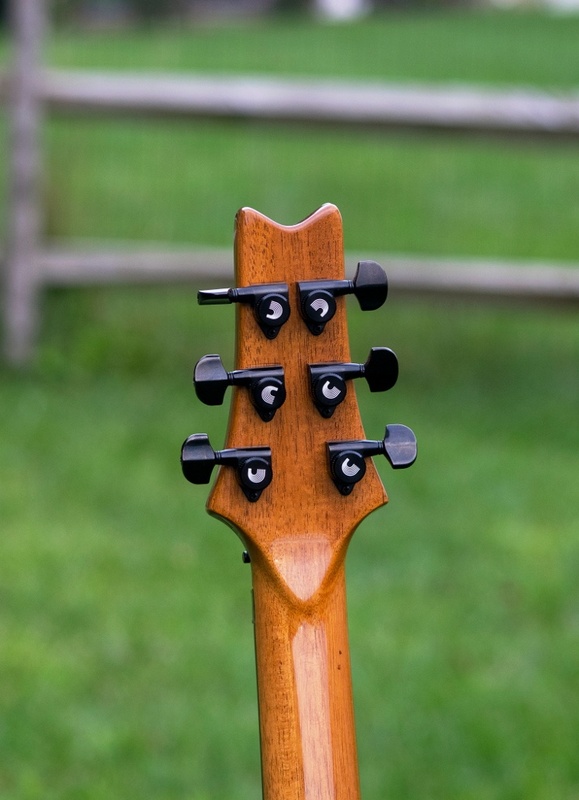 I really love building guitars and the people on this forum and others are exceedingly generous in sharing their knowledge rather than hoarding it and calling it proprietary or trade secret. ProjectGuitar.com It sounds that at least you can thank the other guy for helping you getting bitten by the builder's bug! The (very detailed) forum build thread you developed shows a very uncompromising approach to material choices and solid working methods which clearly shows in the quality of the end result. It's pretty apparent that your backstory and reasonings behind this build were fundamental in distilling focus and providing drive to create something deeply personal and unique. How many builds have you got under your belt to this point? It goes without saying that this isn't your first! skyjerk Well, this is my first build of this model. A prototype if you will, which I'm calling the "24 Magnum". In the order of all guitars built it's actually the twelfth guitar I've built from scratch. My very first was a slightly modified Les Paul design. Visually it resembled a 59 Les Paul in shape and dimensions, but was neck-through-body, I reduced the neck angle, and had some other design alterations that suited my taste and style, so it wasn't a counterfeit or copy. I made no effort to be "vintage correct" and of course I inlayed "Addict" on the headstock rather than the G name. That build turned out so well that I retired my real LP and the one I built became my main player in my band. My very next build was of my own design as were the ones I've built since. It wasn't my goal to build replicas or copies, but to realize my own tastes and desires. I did have some experience working with wood before I started building guitars, and my first career was in construction. I used to build houses. I already had a lot of tools and was good at using them. Of course building guitars requires a lot more precision and care, and I had to learn a lot of specialized knowledge about how guitars actually work and what makes one guitar better than another, etc, but I didn't come in 100% cold. Of course you can't help but work in the things you love about the classics, so this 24 Magnum model has features that I've loved in other guitars, like the PRS custom 24, Fender Stratocaster, etc. although overlaying my design with any other guitar model shows that it's absolutely not a copy of any of them, nor do my specs align with any of them. The back story is fairly straightforward. My 24 year old son Chris passed away just shy of a year ago from an overdose of fentanyl. 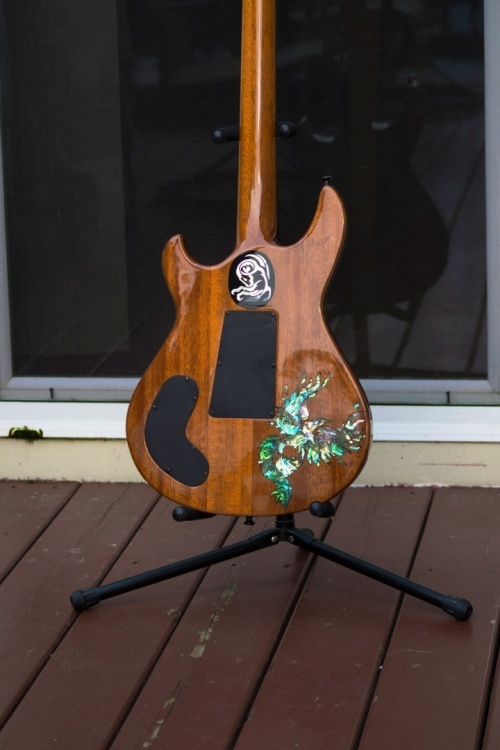 I built this guitar in his memory. The inlays on the back of the body, a Phoenix (mythological bird) and an Aries symbol (zodiac) were taken directly from tattoo's that Chris had on his chest and shoulder, and the inlays on the fretboard and headstock are simplified versions of those same symbols. I was with Chris when he got those tattoos (I actually paid for them) and it's a very fond memory. 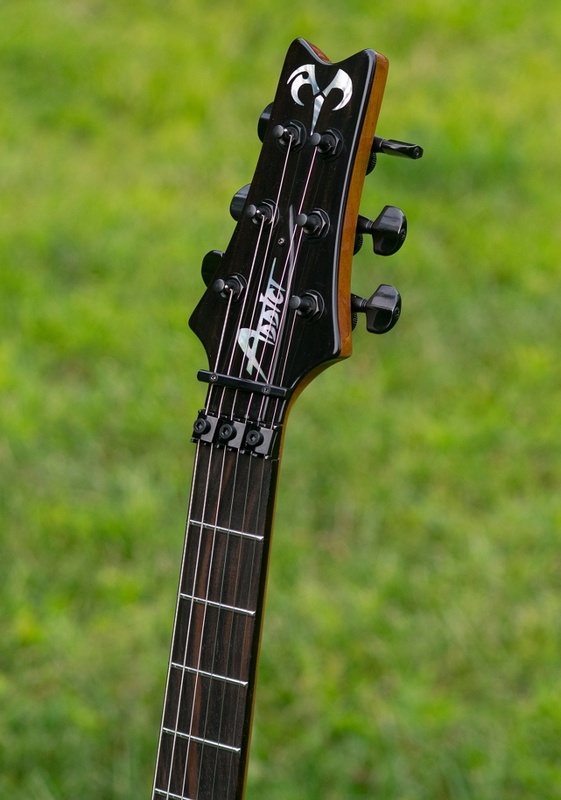 Additionally, the model was originally envisioned as a 22 fret design. 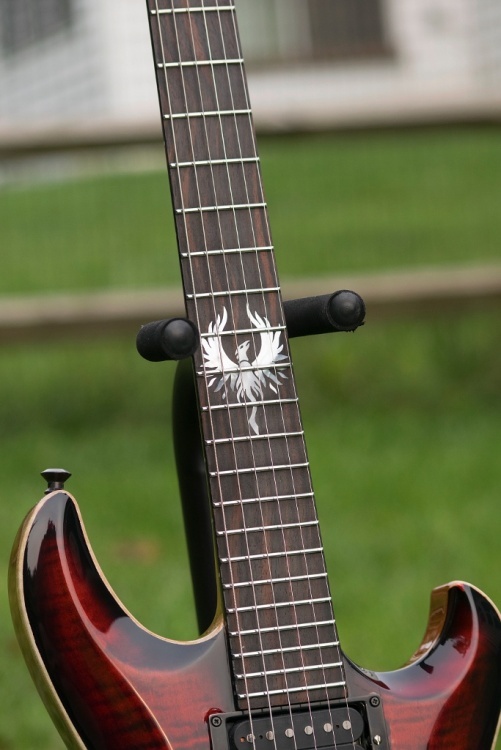 I built a prototype of that 22 fret model (there is a build thread for it right here on projectguitar.com), I never actually finished that 22 fret version because Chris died and it was a little while before I felt like working in my shop as you can imagine. When I did start working again, I set aside the 22 fret build and started from scratch with this 24 fret version in his honor. 24 frets because he was 24 years old. ProjectGuitar.com Phoenix must be a very profound part of reconciling yourself with that loss, whilst also keeping your memories of Chris close to heart. It's difficult to think of a more fitting tribute, and the fact that the guitar itself is plain stunning in every aspect underlines that. Coming into instrument-making with a neck-through Les Paul is no small task. Even somebody that has existing knowledge and skills would find that sort of build a very high target to meet. Over your twelve builds, what have been the major hurdles, discoveries and skills gained? I presume that there's always been plenty of new things to take onboard with each new project. Clean, tight joints are everything when building a musical instrument. Not just for aesthetics, but for good transmission of vibrations. Air spaces and thick glue seams dampen vibrations and make the instrument less resonant, and they look terrible too. Learning how to use hand planes to make perfectly flat, glass smooth surfaces for joining was absolutely my biggest hurdle. Just joining the bookmatched top for that first Les Paul took me about 6 hours and made me feel like an imbecile! Everything about that first build took me 50 times longer than it does today....I'm something of a perfectionist, and I wasn't willing to accept a less than perfect result even though it was my first attempt. Fretwork was another biggie. Nothing in construction prepares you to level, crown, and polish frets either! 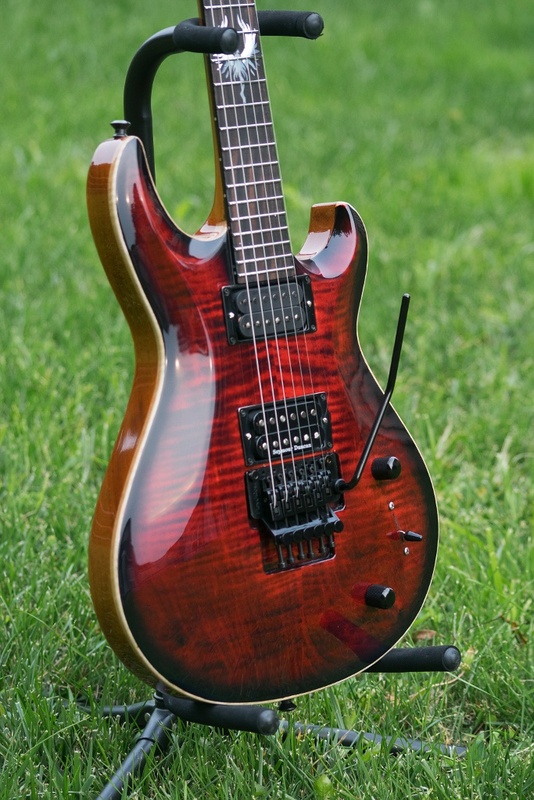 When I finished that build I was very happy with the outcome, but even now every guitar I build leaves me feeling like "This was good, but I could do it better". This is what keeps me learning and improving. ProjectGuitar.com After having made yourself a profoundly personal instrument, you have to wonder....what could be next? You're definitely not the type to call it a day on anything! skyjerk Well, looking forward to the future, my next build, (which I've already begun collecting materials for), is a re-re-imagining of the original 22 Magnum (if that makes sense). It will be a shorter scale (25"), fixed bridge (TOM), and re-implementing the bird inlays I used on the first 22 fret model. 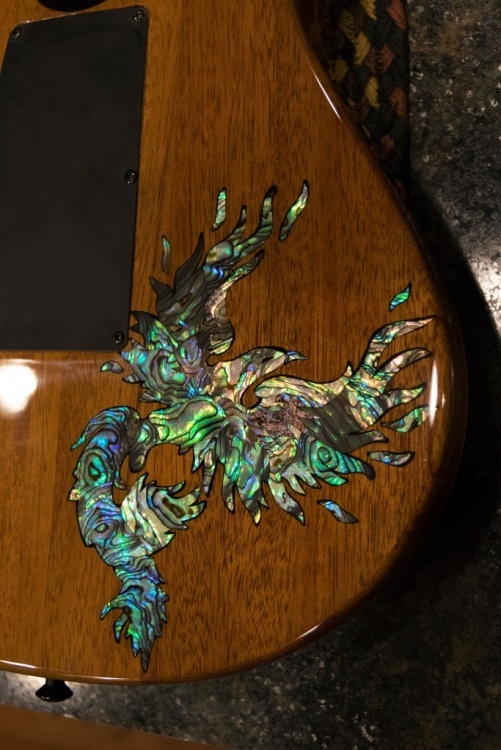 It will have the same type of top carve I did for the 24 magnum, but rather than a flame figure I have a totally gorgeous piece of quilted maple for the top on this one as opposed to a flame, and I'll be finishing it with a tiger-eye burst and matching headstock overlay. I have a terrible weakness for transparent finishes and figured maple. I have yet to do an opaque finish, and don't see any coming in the immediate future. I'm planning to do a build thread here on ProjectGuitar.com once I start, and if it turns out half as nice as I hope I'm sure I'll be entering it as another GOTM contender once it's all finished! ProjectGuitar.com Looking forward to it Chris. I'm sure people will continue to take a lot of inspiration from all of your builds, past and present. 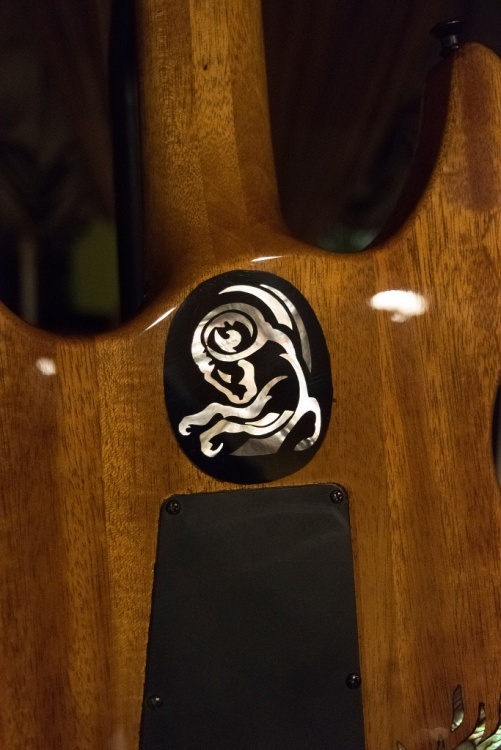 Thanks for sharing your work, and again, congratulations on taking 2018's Guitar Of The Year!